How Can You Be The Light In The Workplace? It’s a new day. As Christians it’s time to take Christ to the workplace. It’s the place where most of us spend the majority of our time and meet the majority of the people we know in life. So how do we accomplish such a feet without doing a disservice to The Kingdom? 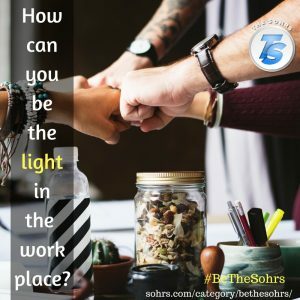 This week’s BeTheSohrs focus is “How can you be the light in the workplace?” How can we shed more light in the place we spend the majority of our time?